This album has more hooks than a fisherman! 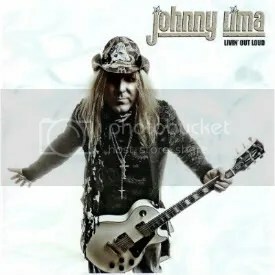 If Wildstreet is the new Def Leppard, Johnny Lima is the new Bon Jovi (with a dash of Def Leppard as well)! The vocal similarities with Jon are uncanny and I love it because JBJ one of my favorite rock singers. You won’t find any attempts at mainstream success through country music here though. It’s all reminiscent of the hard rock and rock/pop that Bon Jovi was known for (and had their most success with) during the 80s. To be honest, I had never knew of Johnny Lima (I didn’t even recognize his name from producing Freakshow’s debut) before reading the Sleaze Roxx review for this album. I went to his MySpace page and fell in love with what was up there for streaming. This is pure fun rock ‘n’ roll, a great blend of 80s/Bon Jovi-styled pop rock and you can sing along (loud) to every song here. None of this sounds date though. Yes, there is the obvious influence, but the only song where it sounds like it very well may have been written in the 80s is on “Hard To Say Goodbye” when the keyboards are in play, but I think that’s a cool touch to the song anyway. Anyone who has an appreciation for old school Bon Jovi and Def Leppard should pick up this album. It’s one of 2009’s best releases and it’s so catchy you’d swear the songwriting credits should have read Bon Jovi/Sambora/Child. I don’t wanna sound like a pitch man, but be sure to check out Johnny’s site and MySpace and then ORDER THE CD at either his website or CD Baby. 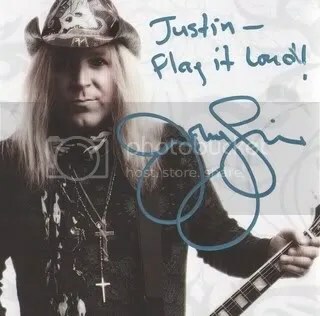 Johnny was nice enough to autograph the inside of the booklet for me!